But he turned and said to Peter, "Get behind me, Satan! Your are a hindrance to me; for you are not on the side of God, but of men." "Do you think it is of God?" I asked. It was a snowy and cold Pifford, NY early morning as I sat there talking to my spiritual director about things spiritual. As I recall, it was December of 2004, and I was seriously praying about leaving the priesthood in the Charismatic Episcopal Church. I learned something from the Hermit into whose eyes I was looking for direction and wise spiritual words. Dom John Eudes Bamberger listened carefully as I was relating some dreams my wife had during this time of discernment. It was about those dreams that I asked the graceful Hermit what he thought. His simple answer was, "We'll see." And then he taught me that spiritual discernment is about three questions: Is it the devil? Is it the Spirit of the Lord? Or is it just something my own mind is telling me? These are ancient questions important for anyone seeking spiritual direction. I suspect they may have their root in this gospel passage before us today. Peter soared the heights of spiritual understanding and spoke with clarity and conviction when he answered Jesus' question, "Who do you say that I am?" Peter stepped forward and answered with these timeless words, "You are the Christ, the Son of the living God." I bet you could have heard a pin drop. The faces of all the disciples standing there exhibited a new understanding as they looked on Jesus with new eyes. The moment was pungent with the sweet aroma of words announcing the end of sin's dread sway - "You are the Christ, the Son of the living God!" Peter appears illumined both by the words just now escaping his lips and the words Jesus proclaims about this servant's role in leading and guiding the Church - "And you are Peter and on this rock I will build my Church, and the powers of death shall not prevail against it." It is simply too profound to find the words adequate to capture this holiest of moments. Beginning from that very moment Jesus begins to show his disciples his destiny, the cause for which He came into the world. To save sinners, to rescue the perishing, Jesus explains his sufferings, mockings and betrayal, his death and his resurrection. Somewhere along the way, perhaps after a few days of listening to this, Peter takes the Lord to the side. He does not want to cause a scene, but enough is enough. "Let's get on with this 'building the Church' and giving the devil his due and defeating the powers of death," Peter is thinking to himself. Rebuking the Lord and most likely explaining, "Hey, if I'm anything like those things you said about me, then I'll be sure that those nasty elders, chief priests, and scribes will deal with Peter first," he proudly and lovingly asserts. The others are over there somewhere no doubt resting and catching their first real sleep in days. This conversation is between Jesus and Peter, the one called to be the first keeper of the keys of the kingdom of heaven. And looking deeply into Peter's eyes with discernment that would raise the hair on the neck, Jesus speaks, "Get behind me, Satan!" Peter's color drains from his face as Jesus continues, "You are a hindrance to me." Peter adjusts his feet, he is thinking sitting down at the Master's feet is sounding good about now. Then with these riveting and revealing words, Jesus says, "For you are not on the side of God, but of men." This is a moment you would think Peter won't ever forget. But then there is that fateful hour when Peter insists to the young maiden, "No, I don't know him. You're mistaken, and now you've really ticked me off. I told you ******I DON"T KNOW HIM!" So why is Peter shown to have spiritual highs and lows? Perhaps it's because like Peter, we need to know when we're motivated by Satan, or our own imagination or - hopefully more often than not - by the Spirit of the Lord. My dear brothers and sisters, each one of us here know we have let that other spirit take us into anger and vengeance and self indulgence of all kinds. Thank God there is forgiveness in the Sacrament of Reconciliation - an opportunity to drink deeply again of the living water of the Holy Spirit. It is my prayer to have more moments when I'm truly led by the Spirit of God. After the Resurrection and the Day of Pentecost, Peter walks more confidently and powerfully in the Spirit. Coming to Mass this morning we can be assured that who we seek is truly that One who for us men and for our salvation came down from heaven. He is the Christ, the Son of the living God! Let us come to his Table and eat this bread and drink this wine - true food for our soul. Then we will return into the world as a living sacrifice of that same Lord whose body and blood fills us now. Amen. And Jesus answered him, "Blessed are you, Simon Bar-Jona! For flesh and blood has not revealed this to you, but my Father who is in heaven." Congregations dividing and splitting is an unfortunate reality in history and in our time. I can't help thinking it is because today's gospel is not truly understood. And when it is read or preached on, the gravity of the passage is not fully explored or is misapplied. It surely is obvious that it has nothing to do with the thirty or forty thousand churches and counting of varying independent groups or denominational affiliations. However, many a local pastor has preached on this as referring to his local congregation being the church against which the powers of death would not prevail and to which the keys of the kingdom have been given. Let's look at this gospel with new eyes. First, Jesus commissioned Peter to teach, guide, and nurture the Church. It is to Peter the Father reveals the nature and identity of Jesus. Common opinions described Jesus as John the Baptist come back from the dead. Others thought he might be Elijah come back to life or Jeremiah or one of the other popular prophets of Israel's history. Varying descriptions of Jesus abound today ranging from profound respect and reverence to mediocre sentiments. But then Jesus asks, "But who do you say that I am?" And it is Peter who replies, "You are the Christ, the Son of the living God." The Holy Spirit helped Peter to see Jesus for who he truly is. This is where the deposit of faith, that which we believe and know about Jesus, is first revealed: Jesus is Son of man and Son of God; he is the Christ! The faith begins with Jesus and his revelation of the Father and the Holy Spirit they give. As Peter looked around into the faces of his fellow disciples, a new awareness of the man who called them from their fishing nets, and tax collecting pierced their hearts. Every house builder knows the importance of a good foundation. Any substantial structure must be built upon a proper foundation or it will not endure. Jesus picks Peter to be such a foundation for the Church. I understand this seems far fetched to my non-catholic brothers and sisters. But remember, our Lord, in order to safeguard the Church of the Living God from schism and division, elevated Peter to lead the Church in the revelation that he confessed, that is, Jesus Christ is the Son of the living God! And that brings me to my third point. Jesus gave Peter the keys of the kingdom. The keys represent the authority of the Church to teach the true meaning of the Sacred Tradition and Scripture, to dispense the grace of God in its sacraments, and to govern the Church of Jesus Christ in the immense love of him who loved her and gave himself for her. It is Peter who first held these keys and every successor of him will do so until time shall be no more. The sacred deposit of faith is under his jurisdiction. Therefore, what we believe and how we worship and what constitutes sound doctrine is not open to every wind of change that blows. The Magisterium is the teaching authority of the episcopacy in union with the Pope; it is the Magisterium which keeps and guards and communicates the faith which was first delivered to the saints. (Jude verse 3) The sacred deposit of faith, found in the Catechism of the Church, is the sacred legacy of that which Peter and those first Apostles received and faithfully taught the church. Subsequent Church Councils have convened to keep the teaching of the Church free from error. From these Councils came the creeds we profess. And at these Councils is where the deep truths of the deposit of faith were mined and articulated. The most recent Council, Vatican II, continues to guide the Church and her witness in this age of the Church. O the depth of the riches and wisdom and knowledge of God! Amen. I have in memory a time when I saw my mother on her knees. She was praying. No one should underestimate the prayers of a mother. It is the faithful and persistent prayers of a mother that has brought the smile of heaven upon a sick child. The prayers of a mom storming heaven has brought home many a wayward, rebellious daughter. And it is the prayers of mom in heaven that still bring the blessing of God upon her children. I remember a very special dream that God gave me many years ago. It was a very difficult and hurtful time in my life. Back in my protestant days I had become pastor of the Pentecostal church of my youth. It was the same church founded by my great-grandfather. And now I was the pastor of that church. But the years had changed me and I was no longer the same 'Pentecostal' boy everyone remembered. I was more polished and had studied more and well, I had become a man and married and now had three small children. New people were coming to our church and the newness of new people and the new 'Dennis' was just too much for the old-timers. They met and decided my fate and voted me out. Me and my wife and our three small children were unceremoniously removed from the Pentecostal church of my youth and was given a 'severance' pay check from the church. I remember thinking, "And this is the church?" These were people I had known all of my life. You might imagine some of the feelings and desperation I felt. I was angry and confused and felt like a foreigner in the middle of everything that I had ever known. I did everything I could to support my family. Times were more than hard. Working at a local grocery store I carried out the groceries for the same people who had made it difficult for me to have groceries. When I worked at the fast food restaurant, I cooked hamburgers for the same some folks who didn't like the Sunday morning food I had been giving them. My life, my emotions, my world was falling apart. And then there was the dream I mentioned. In my dream my mother was telling me that I needed to forgive the people who had caused me so much grief. I remember in my dream the tension and hurt and tears I wanted to cry but couldn't. I cried back to my mother, "It's so hard!" And she answered me with the clarity that she had answered me with a million times when I was growing up, "I know it's hard, but you have to." How does a mother always know? It is difficult with our modern notions to understand the exchange Jesus is having with this little mother from the other side of the tracks. She is a gentile; she and her people are not the heirs of the adoption, the glory, the covenants, the giving of the law, the worship, and the promises. Hers is not the patriarchs nor from her people is the lineage of the one she now addresses as Son of David. She understands her situation when Jesus says it is not fair to take the children's bread and throw it to the dogs. But it is the insight of a mother that replies, "Yes, Lord, yet even the puppies eat the crumbs that fall from their master's table." And it is with the deepest endearment that Jesus exclaims, "O woman, great is your faith!" It is the same endearment Jesus expresses to his own mother in John chapter 2 when he says, "Woman, my time has not yet come." And his mother said, "Whatever he tells you to do, do it." A mother is perceptive when it comes to destiny and things that matter most. Outside of the brief conversations in scripture between Jesus and his mother, there isn't any greater conversation in scripture than this one between Jesus and this mother of the world of the gentiles. No one knows the needs of their children better than a mother. And this mother knows that something dreadful has happened to her daughter. And she intuitively knows that this one she recognizes as the Son of David can heal her daughter. We need more of this kind of courageous and persistent prayer from our mothers in the Church. Not to exclude the necessity and power of a daddy's prayer, but there aren't many words to describe the wonder and the power and the faith that fills the cry of a mother. This precious mother is satisfied that there is a place at the table for her. And she is more than convinced that there is mercy in those crumbs that fall from the master's table. Indeed there is mercy at this Table this morning. At this Table you may bring your deepest needs and prayers. For more than crumbs are offered here; it is the body and blood of him who says to you and to me as he said to the Canaanite woman, "Be it done for you as you desire." And her daughter was healed instantly. Amen. Jesus said, "Take Heart. It is I; have no fear." But the boat by this time was many furlongs distant from the land, beaten by the waves; for the wind was against them. And in the fourth watch of the night he came to them, walking on the sea. Sometimes it gets worse before it gets better. For these disciples it has been a long day and a longer night. It is now the fourth watch of the night; somewhere between 3 a.m. and 6 a.m. Anyone who has cared for a sick child or loved one knows these hours are the darkest before dawn. I remember as a child being really sick all night with the measles or mumps or some childhood disease. I begged my mom and dad to call for Uncle Ronnie to come and pray for me. I must have been about 5 or 6 years old. In the dark hours of the night the limbs from the trees scared me with their shadows on my bedroom window. At the time, Uncle Ronnie was a patrolman for the Huntingburg Police Department. Somehow my daddy got word to him and Uncle Ronnie came into my room about 6 o'clock in the morning. There he stood all decked out in his uniform with his gun belt shiny and bright. And he prayed for me. These disciples have toiled all night to get to the other side of the sea. A storm gets between them and their destination. And it is now somewhere between 3 and 6 o'clock in the morning. Tired and weary they begin to despair. We've all been there. Maybe we haven't navigated a boat in the midst of a storm, but we've all faced strong headwinds of opposition and trial. Misunderstandings and arguments can and do bring sleepless nights. The gales of life are many and in the midst of our efforts we will have trials that make us stronger, confrontations that make us wiser, and failures that make us humble. But the thing to always remember is that the one who sends us into the world as sheep among wolves is on the mountain over yonder praying for us. He truly never leaves us nor ever forsakes us. His eye is on the sparrow and he also is watching out for us. You see we are on the sea of life and our destination is the other side. It is our hope in Christ that gives us the strength to weather the storms of life. 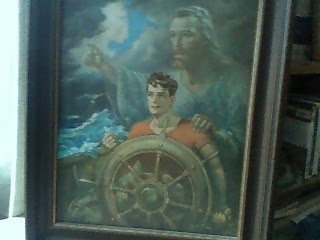 The Captain of our soul is in port in that place where there are no storm clouds, and he is waiting to welcome us there. Not only is he waiting for us to arrive in that holy place, but he often steps out upon our sea tossed moments. He comes out to us walking on the restless waves of our experiences. He navigates through the restless winds and waves to show us we can make it; to help us know he will help us through it all. In such times we learn to trust him more, to love him more, to exclaim with all that is in us our undying allegiance. And if that were not enough, a myriad of witnesses and angels surround us. The lives of the saints give us encouragement and joy. Their witness to faith, hope, and charity inspire us to stay in the boat and to stay on course. If they can sing on that blissful shore then surely their number will not be complete without us. Among them are those who loved not their lives unto death; those of whom the world is not worthy. Unwilling to surrender to fear or flight a holy throng now lends their prayers for our trek through the storms of our faith. Some of them were stoned, sawn in two, and killed by the sword or the guillotine. But their faith is our lighthouse and these who wandered over deserts and mountains, and in dens and caves of the earth, shine brightly knowing they are not complete until we are with them in Paradise. The faith that sustains us remains alive in our hearts and imaginations by that kind, whispering voice: "Take heart. It is I; have no fear." And in this holy food of his body and blood our Lord whispers, "Take and eat. It is I." Amen.